We have previously held several different discussions about brain regions and ADHD. Some have hinted at reduced activity, often measured by lower bloodflow patterns either during resting states or mental challenge, while others have examined different patterns in brain waves and food allergy-induced changes in brain electrical activity. Still others have pointed towards gene-based lowering of chemical signals in key brain regions of ADHD individuals. Additionally, we have looked at articles dealing with alcoholism and the relative size of specific brain regions with regards to ADHD. An overall reduction in gray matter in the right putamen (shown in red) and globus pallidus (shown in blue) regions of the brain has observed in ADHD patients compared to controls. This is an underlying theme among multiple previous studies. The image below is of the human brain with the approximate regions of the putamen and right portion of the globus pallidus regions (the view is from the top down on a subject with the front part of the brain at the top and the back part of the brain at the bottom of the image). Brain volume changes in two other regions, the frontal lobe and the caudate nucleus have been associated with genes related to processes of the key neurotransmitter dopamine. Please note that the frontal lobe has often been tied to ADHD, both through a decrease in size (in the prefrontal cortex region part of the frontal lobe, see below for details). Additionally, the caudate nucleus, actually combines with the putamen and globus pallidus to form a larger brain region called the corpus striatum (see diagram below). 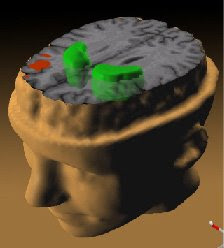 The approximate locations of the prefrontal cortex (brown), globus pallidus (blue), caudate nucleus (green) and right putamen (red) are shown in the image below. As in the image above, we are looking from the top down on an individual who is facing forward towards the top of this page. Adding to this discussion, the article refers to a process in which the globus pallidus acts like a type of highway (the article uses the term "circuitry", but a highway or series of highways may be easier to visualize) between other brain regions, including the caudate and putamen regions. Therefore, the size and shape of this globus pallidus may play an even more crucial role with regards to ADHD and other related disorders, as multiple other brain regions can be critically dependent on it. Many previous publications frequently study brain regions which are easier to study (i.e., ones that are less complex and easier to map and analyze than the smaller and more elaborately dense brain regions), often out of necessity. However, this selection process for sake of convenience can leave out several critical brain regions and sub regions which may actually play a critical role in the brain volume/ attentional disorders connection. At this point, it appears that we are just scratching the surface with regards to studies involving these key brain regions and ADHD. ADHD seems to be more correlated brain volume imbalances due to decreases of specific brain regions, namely the putamen and globus pallidus (see diagram above), rather than relative increases in other brain regions. In other words, ADHD appears to be more of a "brain volume decrease-based" type of disorder, at least at the moment. Studies involving brain damage (such as those caused by impact or injuries to the brain) found a strong association between ADHD symptoms and lesions for both the right and back parts of the putamen region of the brain. It appears that reductions in these sub regions either due to lack of size or damage can elicit similar results which include an increase in ADHD or ADHD-like behaviors. 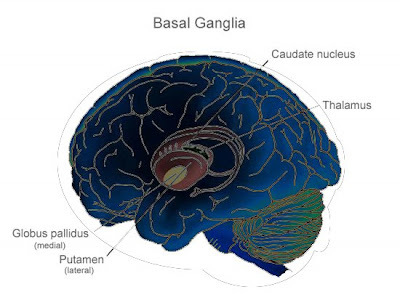 The basal ganglia (the odd "snail-shaped" region in the diagram below, which includes the aforementioned putamen, globus pallidus and caudate nucleus, as well as a few other sub regions we haven't yet discussed) is another key brain region which is believed to be involved in ADHD and other related disorders. The basal ganglia region of the brain essentially determine how fast a person's brain "idles". This region has often been found to be underactive in ADHD and similar disorders and overactive in obsessive compulsive or anxiety-related disorders. Thus the basal ganglia function can have some far-reaching implications. Not surprisingly, then, is the fact that mis-development in the "wiring process" of the basal ganglia (such as seen in the formative years), may play a crucial role on the onset of ADHD both directly, and indirectly (via interaction with other key "ADHD" brain regions). Returning to the two main brain regions of investigation (the globus pallidus and the right putamen) for a moment, we see that these brain regions may also play a key role in governing the response to and effectiveness of potential ADHD medications. For example, a positive response to the ADHD stimulant methylphenidate (Ritalin, Concerta, Daytrana) may be influenced, at least in part, to the function of the right putamen region of the brain. According to this study, a higher level of bloodflow to the right putamen region (among a few others listed in the study), was significantly correlated to a positive response to the methylphenidate medication. In other words, a functionally active right putamen brain region may increase the odds of a child being able to tolerate their Concerta, while children with reductions or abnormally slow developments of the right putamen might be prone to less success with this type of medication. As of now, it is unclear if this brain region exhibits the same effects on other ADHD stimulants as well. It is also likely that metabolic differences in the globus pallidus play a role in ADHD. A metabolic study involving the ratio of two types of "fuel" (creatine and N-acetylaspartate or NAA), which is often a good indicator of neuronal health in several key brain regions, found that individuals with ADHD had an abnormally low ratio of NAA to creatine. Taking this one step further is the topic of supplementation. Creatine supplements, often used by exercise enthusiasts, have been shown to boost levels of this nutrient to the brain as well, which can decrease the NAA to Creatine ratio (i.e., more creatine and less NAA). This brings up the hypothetical question as to whether creatine supplementation can actually exacerbate some of negative effects of ADHD by tampering with this desired ratio. We will actually be exploring the topic of creatine supplementation and its effects on the brain in another blog post in the near future. Nice blog and good and very interesting articles about the causes of ADHD! I was just reading an article about creatine and it made me wonder if it might aid in ADD/ADHD any. Interesting indeed. It can't really work, I suppose like this. Might have to try this. As a young boy 2 years of age I fell out of a two story house severe head trauma. Docs were surprised I lived. I came across through your blog. I found the valuable information about ADHD treatment from your blog. The great content sharing through your blog. Thanks for sharing. Are ADHD Genes Gender Dependent?